As Engels pointed out long ago, capitalism cannot solve the housing problem. Socialism alone can provide adequate and decent housing to all working people. We reproduce below an excellent presentation made by architect Katt Cremer to the Stalin Society in London on 16 October 2016, which clearly demonstrates how, in a remarkably short period of time, the Soviet Union, although incomparably poorer than many imperialist countries, was able to house its working population in conditions worthy of human beings. “The first premise of all human existence is … that man must be in a position to live in order to make history. But life involves before anything else eating and drinking, a habitation, clo-thing and many other things” (K Marx and F Engels, The German Ideology (1846), International Publi-shers, New York, 1947, p.16). Comrades, before capitalism mankind constantly suffered for a shortage of life’s essentials. In part, this was because his primitive technique prevented it from producing sufficient quantities of the things needed. Modern scientific modes of production are capable of producing abundance. Modern science and advanced technique, large scale industry and machinery can produce many more things than man can consume, and yet because of capitalism, because of private ownership, workers remain hungry, thirsty, in need of housing, clothing and many other things. Today in Britain, amongst many other problems and social diseases, there is a profound housing crisis. This meeting of the Stalin Society, far from being concerned with historical re-enactment or mithra worship, will look to the example set by Soviet workers during the building of socialism, when, led by the CPSU with comrade Stalin at the helm, the Soviet people set about abolishing the terrible conditions of housing which prevailed in pre-revolutionary Russia. Before I begin I must remark that I have been asked to talk on this subject today as the society Secretary thought I may have some personal insight which comes from having been trained as an architect in a typical British architectural practice. I can say that I have seen from my own experience as an architect the positive role that housing (and house planning) can play in relation to the character of an area and the wellbeing of its inhabitants. Whilst town and city centres may have the principal iconic buildings or squares that give a sense of uniqueness, it is not the show pieces of capitalist enterprise and commerce that shape the entire appearance of a city – they merely occupy the foreground. Whilst those structures certainly enrich a landscape and bring joy to the eye, what makes up a city’s spirit and overall demeanour are the hundreds upon thousands of residential buildings that are its background, its streets and avenues that are its shape, the millions of houses in which the working people live and bring life. I will attempt to show you examples of both in this presentation. The housing question is a primary question for communists in Britain today. As we seek to put the case for socialism to British workers, we benefit from having the experience and example set by the Soviet Union. We face every day the insanity of our current situation where more than 650,000 properties lie vacant and 200,000 people live on the streets, in the gutters, under the bridges and shop doorways. Hundreds of thousands live in desperate housing conditions, many failing to keep pace with spiralling rents as private landlords capitalise on the acute housing shortage. The luckier workers waste their lives paying mortgages that in many instances account for half the family income, hoping to be ‘home owners’ by the time the state comes to sell their property to pay for their care home costs. In the Soviet Union no such insanity was tolerated despite having to start from incomparably worse beginnings. The October Revolution nationalised large homes, and vacant properties were shared amongst the people, rents were kept to less than 4% of workers incomes, and a focus on decent living standards for all was the State’s priority. The Soviet Union tackled at break-neck speed a severe housing problem inherited from Tsarism, a problem compounded by the devastation of the war of intervention and later by WW2. The Soviet government put the housing of its people, all across the vast territory USSR, as a high priority that warranted focus, investment and planning. In Russia before the Great October Socialist Revolution the habita-tion of workers and peasants was extremely depressing, it is a wonder those suffering millions had strength to make such remar-kable history. Russian workers in the early part of the twentieth century were clustered in damp and cold mud huts and barracks with double-tiered plank beds, two or three people per bed. In 1912, there were 24,500 cubbyhole flats in Moscow housing an incredible 325,000 people. In the very same city there were the noblemen’s mansions and bourgeois villas housing single families. In these relative palaces, space per resident was often as high as several hundred square metres. Nowadays we usually attempt to measure overcrowding by counting how many individuals have to live in a single room. But in the industrial districts of Tsarist Russia more than half the factory workers had no rooms at all! “According to the findings of a special investigation made in St Petersburg in 1908, only 40 percent of the textile workers had separate rooms; the remainder found shelter in overcrowded barracks, where they occupied separate bunks. On average a working family had only three square meters of floor space. And this in St Petersburg where the workers enjoyed comparatively better living conditions than elsewhere” (Sidney and Beatrice Webb, Soviet Communism – a new civilisation, Victor Gollancz, London, 1937). By 1913 conditions had not changed significantly. 58% of the workers lived in company-owned accommodation. This still usually meant a factory barracks with plank beds arranged in two tiers. Similar conditions existed in the traditional industrial regions; for example, in the textile centres, living conditions were frequently as bad, with up to 40 persons sleeping on plank beds arranged in two or three tiers occupying one room at densities of 1.5-2.5 sqm per person (see Gregory Andrusz, Housing and Urban Development in the USSR, Suny Press, Albany New York, 1985). In 1914, while some 5,000 large comfortable flats were vacant in the central part of Moscow, the city and its suburbs had about 27,000 ‘bedroom flats’, in which only the individual beds were let. With over 300,000 persons living in these flats, it meant that each room had an average of a dozen tenants (see Yuri Yaralov, Housing in the USSR, Soviet News, London, 1954). Municipal facilities were also primitive, the water-supply system in 1916 existed in only 200 of the country’s 1,084 towns, with only 10% of houses in these towns connected to the system. 23 towns possessed a centralised sewerage system, though only 3% of houses were connected and only 5% of all urban dwellings had electricity; a mere 134 towns had any form of electric street lighting. As Russia was an imperialist power, its vast colonies stretched in all directions. Here the workers in the Urals, the Donets Basin and Baku were particularly hard hit by cramped and insanitary conditions. The writer Maxim Gorky visited the Baku oil workers’ homes before and after the Bolshevik Revolution He recalled: “I never saw so much filth and refuse around a human habitation, so many broken windows and such squalor in the rooms, which looked like caves. Not a flower in the windows, and not a patch of land covered with grass or shrubbery around.” In 1928 Gorky again visited Baku, and when he saw the workers’ residential districts he wrote: “Baku affords indisputable and splendid proof of the successful building of the workers’ state and the creation of the new culture – that is the impression I got” (quoted by Yuri Yaralov, op.cit.). The centre of Baku changed over the course of 60 years to 1954. From a rather drab central square to a bustling hub complete by the 1930s with tall buildings and lower rise buildings, landscaped space with tiered steps, and a modern tram system. By the 1950s the scale and prestige of the square is clear. A large amount of green space is retained, with large trees, not the twigs that we get in most developments here these days. “It is a paradox of social statistics in every country that some of the greatest advances in social organisation are made the subjects of the bitterest reproaches. 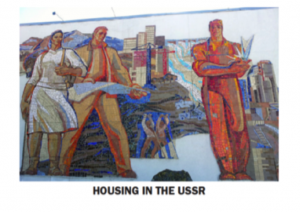 This is the case with regard to the service of housing in the Soviet Union. “The living conditions of the mass of the people in the industrial centres of Tsarist Russia, as well as in the villages, were so appallingly bad, and the rapid growth of the city population during the past decade has been so overwhelming, that the utmost efforts at rehousing have so far scarcely kept pace with the very-enlarging needs. “…it is clear that every social system and every social movement in history must be evaluated not from the standpoint of ‘eternal justice’ or some other preconceived idea, as is not infrequently done by historians, but from the standpoint of the conditions which gave rise to that system or that social movement and with which they are connected. “Everything depends on the conditions, time and place. “It is clear that without such a historical approach to social phenomena, the existence and development of the science of history is impossible” (Dialectical and historical materialism, Lawrence & Wishart – Little Stalin Library, London 1941, p.10). Having now appreciated some of the historical context for the housing question in the USSR, it will be possible to look at what was achieved and to appreciate it in all its significance. We will begin by looking at those years immediately following the October Revolution. The second decree, issued by the new Soviet government on the day after the revolution, abolished the private ownership of land. In towns with over 10,000 people the government abrogated the right of private ownership of buildings whose value exceeded a certain limit set by the local organs of power and so before the end of 1917 large residential buildings had been nationalised. Hundreds of thousands of workers were moved out of the slums into nationalised houses. Housing policy consisted of redistributing the existing stock by sequestering and requisitioning houses belonging to the nobility and bourgeoisie. Just days after the revolution the People’s Commissariat for Internal Affairs issued an order granting the right to sequester empty buildings suitable for habitation and to use them for people living in overcrowded or unsanitary conditions. It also entitled workers to set up housing inspectorates, tenants’ committees and courts for settling disputes arising out of the letting of buildings. Imagine now those 5,000 large comfortable flats that we heard were vacant in 1914 in the central part of Moscow being requisitioned and used to house some of the 300,000 people sharing the one bed flats, or the sick, injured and lame soldiers who returned from the front. Now imagine here the government issuing a decree requisitioning the 650,000 vacant houses in Britain to house the almost 200,000 officially homeless, not to mention those holed up in doss houses and so-called B&Bs because there are no social houses available. Perhaps, comrades, we might ask our revisionist friends in the CPB to raise this proposal when next they take tea with Jeremy in Islington? The Programme of the VIII Party Congress in March 1919 declared that: “Soviet power, in order to solve the housing problem, has expropriated completely all housing belonging to capitalists and has handed these over to city soviets; it has brought about a large-scale resettlement of workers from the outskirts of cities into the houses of the bourgeoisie; it has transferred the best of these houses to workers’ organisations”. Housing space was redistributed according to need based on a definition of a minimum requirement and a maximum entitlement of space per person. The Commissariat for Health (Narkomzdrav) in 1919 set the minimum space requirement at 8.25sqm /person of actual living space and 30 cubic metres of air space for each adult and 20 cubic metres for children under age 14. It should be noted in relation to these figures about living space that there are different approaches to how such numbers are calculated. In Britain we refer to our houses by number of bedrooms not by any reference to the floor area, as is the standard in most other European countries. This is a fantastic trick played on all of us as the average detached house may actually be considerably smaller than a flat in Paris or Berlin. But that surely won’t put off the aspiring homeowner if he has an extra box-room to brag about. It is now commonplace for a room just big enough to fit in a single bed to be classified as a bedroom and the house price rise. Historically, in the post-war period of social democracy when British workers most benefited from imperialist sops there were minimum space standards required for local authority and social housing. In 1961 the Parker Morris standard was applied to all local authority houses which, for example, required a 2 person flat to be a minimum of 44.5sqm and a 4 person flat to be 69.6sqm. These figures however, only ever applied to social housing, i.e. less than 30% of our housing stock. In 2015 the Technical Housing Standards were introduced that improved standards, for example a 2 person flat went up to 50sqm and a 4 person flat to 70sqm. Yet again, rather than introducing these as mandatory requirements for all housing as part of the Building Regulations, which they inform, they are optional and become part of a planning system where each local authority has to adopt them through their long winded and bureaucratic Local Planning process. In the Soviet Union space was calculated based on actual living space, i.e., it only included the living and bed rooms, with kitchens, corridors, entrances and bathrooms not included. This additional space would increase the actual area of any flat by between 30 and 50 percent. The space standards used for Parker Morris and the Technical Housing Standards include the total area within the external wall, i.e. the actual living space plus the kitchens, corridors, entrances and bathrooms! The same is true for the European standards—the areas are the total areas within the four walls of a flat or house. Such are the nuances which can be observed in the imperialist countries as opposed to the workers’ republic. Russia, having been reduced to a state of ruin by four years of imperialist war and three years of intervention was indelibly scarred by an acute housing shortage despite the measures taken in the days immediately following the revolution. The material damage caused to housing alone by the civil war and intervention amounted to more than 2,000 million gold roubles. In Moscow, between 1914-1921, the number of urban houses destroyed or rendered unfit for habitation amounted to almost one fifth of the living space. Despite these setbacks, resettlement had continued, and between 1918 and 1924 half a million workers and their families in Moscow alone were moved into better flats. Previously, working class families had accounted for no more than 3% of the residents in Sadovaya Koltso district, the best part of the city; following the resettlement the percentage went up to 40-50%. The same was true of Leningrad and other cities. Up to then rents had been high, making it impossible for workers to live in decent accommodation (see Yuri Yaralov, op.cit.). It was understood, however, that resettlement could not meet the housing needs of all the working people and even whilst the White army and their allies were attacking the fledgling Soviet Union, construction of new houses was underway. In 1920 alone, 254 residential buildings were put up and 2,347 old ones were repaired within the 58 gubernias of the republic. While this was no more than a modest beginning. It was an indication of the determination of the Soviet government. In the five years 1923-1927 well over 12.5 million square metres of living space was built in the USSR, and in the following five years 1927-1931 another 28.85 million square metres. It should be made clear that this construction was not confined to the existing old towns. In the 13yrs from 1926-1939, 213 new towns and 1,323 new urban communities appeared (see Yuri Yaralov, op.cit.). In all, the number of towns in the USSR increased from 675 to 1,451 between 1917 and 1951. These new towns and settlements grew up everywhere – in the steppes of Kazakhstan, in the industrial areas of the Ukraine and the Urals and beyond the Arctic Circle. “With regard to housing, as in so many other activities of Soviet communism, we see the characteristic devotion of endless time and thought to getting the best scheme or plan. The planning of new cities, or the rebuilding of old ones, is in the USSR not a fad of philanthropists or utopian architects, but a recognised part of the art and public administration, forced on the attention of statesmen and officials, architects and builders, and also the general public, by elaborate specialist museums and research institutes, and by organising, periodical public exhibitions, with exceptionally vivid maps and diagrams, explaining how each city can best be transformed and developed. “The extension of such cities as Moscow and Leningrad, for the next twenty or thirty years, has been exhaustively studied and graphically delineated, having regard to the more convenient location of additional factories, amount of new housing, means of communication and locomotion, supply of water and electricity, disposal of surface water, sewerage and garbage, maintenance of open spaces, construction of stadiums, provision of schools and higher education, hospitals and clinics, public baths, fire stations and every kind of public office” (Sidney and Beatrice Webb, op.cit.). During the period of the Second Five-Year Plan 1933-1937 the area of living space built by the state alone, and turned over for occupancy amounted to 27.34 million sqm. Altogether in the first 20 years of the Soviet government practically as many large residential buildings were built as existed in all the towns of the country before the revolution. A comparison of the average living area per person in workers flats before 1917 and in those at the beginning of 1938 shows a striking change. In Leningrad, for instance, the average living area per person doubled, in Moscow it was up 94%, in the cities of the Donbas 176% and in the Urals 195% (information based on the census taken in 1938). While the trajectory of housing in the Soviet Union was going in an upward direction the same cannot be said for the situation for workers in the imperialist heartlands. For example in Britain the condition of housing for workers was still dire. We must again remember how to study history, as Stalin said, it is determined by conditions, time and place. So, let us turn for a brief moment to compare Soviet Russia, so traumatised by war and intervention with another country during the same period. Let us take Britain in the 1920’s and 30’s, the world’s oldest imperialist country. Limited improvements in housing standards that had been initiated in 1919 in response to pressure from workers and returning soldiers from the war, and the fear of revolution spreading, were quickly vanishing during the 1920s and 1930s, as Britain and the capitalist world proceeded headlong into one of the periodic crisis of overproduction. In 1924 the Wheatley Act was introduced with the principal objective of securing a continuous building programme to address Britain’s acute housing shortage. The Victorian age had seen an influx into the cities and the squalor in which workers lived was generously provided, in the main, by private landlords. So long as rents were kept high very few capitalists took much interest in providing or building new homes, as they had more profitable avenues of speculation in those days. The Wheatley Act and government policy had to turn, in some small way, to the question of social housing, or at the very least to planned provision. The Act aimed to tackle the shortage of homes over a period of 15 years and to erect houses that would be let at lower rents to meet the position of lower wage earners. However, under capitalist conditions restricting future rents merely resulted in a corresponding reduction in the size and standard of the houses that were built, and were consequently developed at a higher density. For instance, during this period, a new three bedroom house was often only 57sqm compared to over 90sqm in 1919, which could be translated as approximately 14sqm/person and 23sqm/person respectively. By comparison to this downward trend in Britain, the Soviet Union was striving to improve the lot of the worker and peasant. The living space for a worker was increasing from under 2-3sqm/person in 1913, to providing three room family homes of over 60sqm or 16sqm/person by 1923. “In England and Wales… 4.5 million people (12 percent of the population) were crowded together with two or more persons to a room. In Scotland the overcrowding was much worse – 35 percent of the population lived more than two persons to a room” (Noreen Branson and Margot Heinemann, Britain in the 1930s, Panther, London, 1973, p.200). “The worst houses were damp insanitary slums. The typical London slum was a two-storey four-bedroomed terraced-type house with a lean-to wash room. The fabric of the house would be porous, the roof leaking, the wall plaster perished, the ceiling sagging. A defective water closet would be in the yard, so would the only tap… towns in the north had even more intense problems. Leeds had scores of thousands of “back-to-backs” houses built at seventy or eighty to the acre, damp, decayed, badly ventilated, dark, with one outside lavatory to every three or four houses. Birmingham too, had 40,000 ‘back-to-backs’. Liverpool had probably the worst slums in England; here there were people living in cellars ad courts whose building had been prohibited in 1854. In Liverpool 20,000 people were living more than three to a room. In Glasgow, where the slums were far worse than the worst in England, nearly 200,000 were living more than three to a room” (quoted by Branson and Heinemann, ibid. p.203). In Russia on the hand there were no slum landlords. Housing was social and rents were kept low. The lowest-paid workers often only had to find two or three roubles per month, representing perhaps 2% of their income. Moreover, a poor man would pay less for his share of an apartment than someone better off having the same space. “My first inclination” he recalled, “was to compare this lowest-paid Soviet family with an unemployed family in England. As regards food and clothing, their expectation would be approximately the same. There are, however, several qualifications which disturb this comparison. “In the first place, the wife in such a Russian family would almost certainly be at work, earning not less than 125 roubles a month herself. Her children, if young, would be in a crêche all day where they would be looked after and well fed for a nominal payment. Russia does not allow under-nourished children. “Deliberately I have started my comparison with the lowest-paid (there are no unemployed in Russia) worker. But the average wage of the Soviet worker and employee this year is about 270 roubles per month. If the wife works, the family income doubles this amount. Life on such a level would take on a very different aspect. Small luxuries would be possible. Clothes would be things saved up for. Such a family would have ample to eat and drink and money enough to enjoy their leisure” (Paul Winterton, Russia – with open eyes, Lawrence & Wishart, London, 1937). Such improvements as Winterton explains were matched in the former colonies of Tsarist Russia. Great progress in housing construction had also been made during the course of the first and second five-year plans in the formerly economically backward national republics, where in the years after the revolution industrial development was particularly rapid. In Kazakhstan, for instance, state-owned housing increased 5.5 times between 1926 and 1940, in Georgia 3 times, in Kirghizia (modern day Kirghizstan) 6.5 times, In Frunze, capital of Kirghizia, state-owned housing increased 110 times, and in Alma Ata, capital of Kazakhstan 160 times. Thus from year to year, month to month, the rate of construction throughout the country kept growing and housing needs were gradually being met. “In 1939”, recalled Soviet architect Yuri Yaralov “I had occasion to make a study of an old architectural monument in Armenia. I had imagined that it was in the mountains, far from any inhabited place. Imagine my surprise when one evening, as I was approaching the object of my search, I saw in the small valley a settlement flooded with electric light. “Descending to the settlement I found a few streets lined with stone cottages. Going over to the nearest house I asked a man, sitting on a bench outside, where I was. It turned out that this was a settlement put up by the nearby building materials factory which had been built not long before. The man invited me into his house. “As an architect I was interested in its layout. Three rooms, a kitchen, bathroom, lavatory, a glassed-in veranda and an open balcony were conveniently and compactly arranged. The house had central heating. A family of four lived in this house. “The next time I had occasion to be in that settlement was in 1953. By that time it had 117 two-storey houses in which the workers and their families lived. The settlement also had a school, club, library, hospital, dispensary and pharmacy, kindergarten and nursery, two restaurants, shops, a post office and a hotel. “Such settlements are put up near all the mills and factories that are being constructed in large numbers in the USSR” (op.cit.). “Doubtless there are mistakes and unforeseen contingencies in all this elaborate forecasting of future action. But it is hard to believe that deliberate planning is not better than leaving everything to haphazard individual decisions when the moment arrives. So wrote the Webbs barely two or three years before Nazi Germany traitorously attacked the USSR! Lucky then the Soviet people had adopted Bolshevik tempo! In 1941 the Great Patriotic War began. No state suffered as much loss in the war against fascism as the Soviet Union. Not only did she sacrifice 27 million people in defeating Nazi Germany she also suffered the complete or partial destruction of tens of thousands of towns and villages, with the Hitlerite forces burning or wrecking more than 6 million buildings. Some 25 million Soviet people were left without roofs over their heads. It looked as though decades would be needed to restore everything that had been destroyed, to provide shelter for the millions of people and rehabilitate industry and agriculture. Yet the Soviet people showed otherwise. With the enemy still on Soviet territory, shelling Leningrad and holding Smolensk, rehabilitation was in full swing in the liberated areas. The 22 August 1943 saw the publication of a decision of the Council of People’s Commissars and the Central Committee of the Communist Party on ‘Urgent Measures for Rehabilitation of the Economy in the Areas Liberated from German Occupancy’. It was underscored in the decision that the Soviet government regarded it as an urgent task “to restore old and build new dwelling houses from local building materials in villages, towns and industrial settlements liberated from German occupation in order to make sure that collective farmers and workers at present living in dugouts and demolished houses should receive premises fit to live in”. In 1944 alone, 839,000 houses were restored or built anew in rural areas, and more than 12.5 million square metres of living space in towns in the liberated area of the USSR. In that one year some 5.5m people whom the war had deprived of shelter received comfortable living quarters. Such are the mere footnotes to the Soviet people’s dazzling achievements in this period! This construction was not restricted to liberated areas: construction continued apace in parts of the Soviet Union away from the front. In Gorky, more than 137,960 sqm of living space was built, and in the Siberian town of Irkutsk some 19,200 sqm was built. In the same year that Hitler’s hordes were heading for the Volga, a State Theatre of Opera and Ballet, with a seating capacity of 1000 was completed in Stalinabad, the capital of Tajikistan. In Moscow, seven new Metro stations were built in the course of the war. “The very fact that these splendid works of Soviet architecture were built then showed that the Soviet people were firmly convinced of their victory” (Yuri Yaralov, op.cit). After the second world war the growth of the urban population continued. By 1954 almost 185 million sqm of living space was built in towns and industrial settlements, and more than 4 million homes in rural areas. The directives of the 19th Congress of the Communist Party of the Soviet Union in 1952 provided for the construction of some 105million square metres of living space by the end of 1955, the last year of the fifth five year plan. In fact the fifth five year plan exceeded this provision by an additional 30% at 151.7million square metres. The volume of state housing construction for 1956-1960 was set as 214.9 million square metres of total floor space, almost twice as much as the fifth five-year plan. It is this increase in the rate of construction, in the face of all the obstacles that were put in the way that is astounding. “What is the cause of the fact that the USSR, despite its cultural backwardness, despite the dearth of capital, despite the dearth of technically experienced economic cadres, is in a state of increasing economic upswing and has achieved decisive successes on the front of economic construction, whereas the advanced capitalist countries, despite their abundance of capital, their abundance of technical cadres and their higher cultural level, are in a state of growing economic crisis and in the sphere of economic development are suffering defeat after defeat? “The cause lies in the difference in the economic systems here and in the capitalist countries. The cause lies in the bankruptcy of the capitalist system of economy. The cause lies in the advantages of the Soviet system of economy over the capitalist system. “What is the Soviet system of economy? “(6) the working class and the labouring peasantry are the masters of the country, working not for the benefit of capitalists, but for their own benefit, the benefit of the working people. “Such are the advantages of the Soviet system of economy over the capitalist system. In his speech at the conference of the RCP(B) in May 1921, Lenin said: “At the present time we are exercising our main influence on the international revolution by our economic policy. All eyes are turned on the Soviet Russian Republic, the eyes of all toilers in all countries of the world without exception and without exaggeration. This we have achieved. The capitalists cannot hush up, conceal, anything, that is why they most of all seize upon our economic mistakes and our weakness. That is the field to which the struggle has been transferred on a world-wide scale. If we solve this problem, we shall have won on an international scale surely and finally” (Vol. XXVI, pp. 410-11).